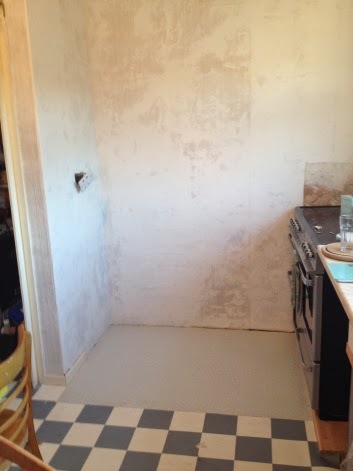 Home » Home Improvement » Kitchen chronicles – We have a floor! 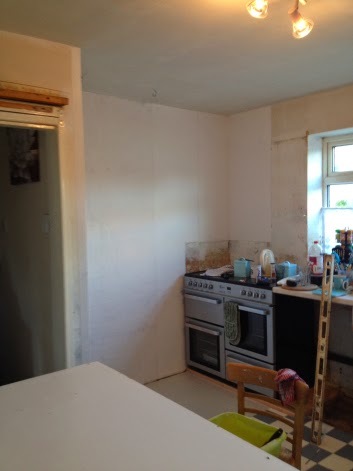 Kitchen chronicles – We have a floor! You may recall we’ve been without a proper kitchen for just about the whole time we’ve had the house and at times it has really got us down. The paste is still wet which is why it looks patchy! It finally feels like we’re on the way to getting a proper kitchen and I have to say I’m beyond excited! I really cant wait to get unpacked properly and make it all pretty! In another couple of weeks we should have a normal house, one where rooms aren’t used as storage for items from other rooms and where I’ll be able to hoover the carpets and mop the floors without having to shift boxes/books/white goods to be able to get to the floors! I do have the sheds and greenhouse to sort out as we’ve been using them to store more boxes but the majority of that will be garden stuff that needs to stay in the sheds and a few more bits for the loft. It must be such a relief to see all your hard work coming together! Love how it's all coming together. It feels wonderful when things start taking shape. Exciting times ahead. It's looking great! bet you can't wait to have it complete! It's looking great and soon all the stress will have been worth it…I'll be going through the same thing next year – wish me luck!! All coming together! I can't wait to see the finished kitchen! This looks very familiar! We are currently living in one room of our house and I can't wait for everything to be sorted! Lucky you to have such a handy other half! You are making excellent progress 🙂 so exciting!